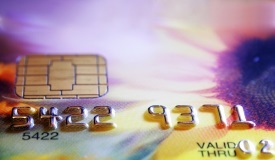 Is your Business Accepting the new Chip Card? Has your business upgraded to the EMV chip-activated point-of-sale terminals? Let’s consider the technology, and how it can help your business. Credit card companies are replacing traditional magnetic-strip credit/debit cards with new chip cards, commonly known as EMV cards. EMVco explains the EMV chip technology, and how it works with your business. The site also provides regular updates and best practices. With the new chip cards, “swiping” will no longer be the recommended process for accepting credit/debit cards. Rather, customers will be “dipping” their card, by inserting it into the EMV chip-activated terminal. The chip, which has an integrated circuit instead of a magnetic strip, holds encrypted information about both cardholder and the transaction. It is used to validate the authenticity of the card, thus making the transaction more secure. EMV cards have been generally adopted around the world, and have been used for some time in many countries. The United States is now mandating the technology starting October 1, 2015. Gene Marks, President and CEO of the Marks Group PC, recently shared an article on Open forum explaining how this new payment change may impact your business. It is important to know that starting October 1, 2015, those businesses that have not started accepting EMV cards and have not commenced using chip card terminals could face possible financial loss should a fraudulent transaction take place. The liability may shift from the card issuer to the merchant. Historically, the credit card issuer held the liability for fraudulent transactions. Your business may need to budget for cost of the new EMV enabled equipment. For more details about the liability shift please visit Visa®. While the new chip cards are not difficult to use, there could be a period of adjustment for consumers and merchants. It is suggested by most credit card issuers that companies should embrace the new technology, and train their staff accordingly. For some companies, the equipment upgrades may be costly and time consuming. The fraud prevention aspect is a real benefit, but will your cash flow allow you to perform the necessary cost to upgrade? There may be considerable benefits when your customers realize you have taken the extra steps to make sure their transactions are as safe as possible. The new equipment also makes it easier for employees to carry around mobile devices with chip-enabled technology. If cash flow is already a challenge, taking on the new costs involved with upgrading your point-of-sale equipment and training your staff, this may make the transition tough. Consider the benefits of factoring your accounts receivable. Invoice factoring helps eliminate the time period between invoicing and payment and can provide the cash you need to embrace new technology.